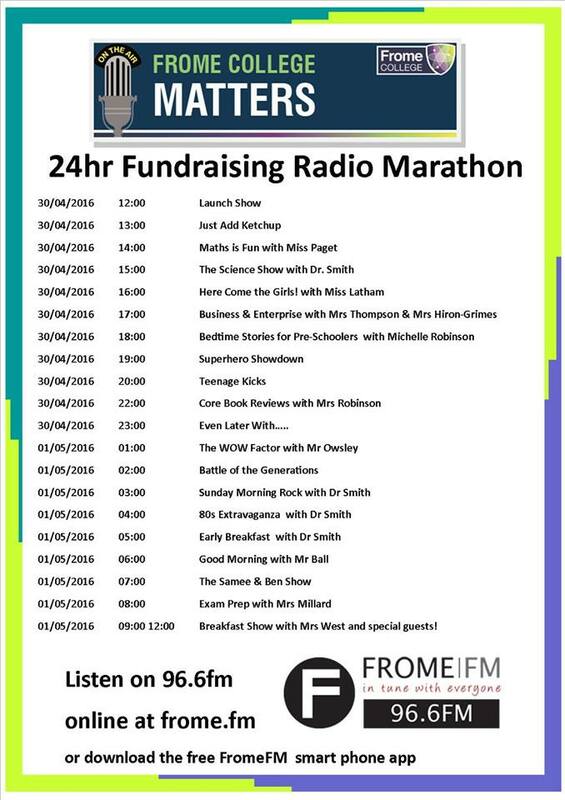 Starting Saturday 30th April 2016 at noon, Frome College students staged a ‘24hour takeover’ of FromeFM. This will be the first time a group of school-aged children have broadcast live for 24 hours continuously from a community radio station in the UK. The event attracted national, as well as local, media coverage. They will be doing this to raise funds for training and equipment for the Frome College Radio Club who want to record a fortnightly show for FromeFM. The show, ‘Frome College Matters’, enables students of all abilities to meet, work with, and get to know people within their community; and allows them to have a say in services that affect them.